„lookingBACK“ and the question of gaze – Wie weiter mit Humboldts Erbe? In October 2017, in the midst of the scuffle over Humboldt’s legacy, a permanent exhibition with the cautious title „zurückGESCHAUT” (lookingBACK) opened in Berlin’s outer district of Treptow. With this exhibition, the Museum of Local History critically engages with the First German Colonial Exhibition, which took place in 1896 on the grounds of the Treptower Park in Berlin and looks back, in particular, at the stories of the performing participants of that exhibition from Africa and Oceania. This review takes the title of the exhibition as an opportunity to examine how this exhibition deals with different forms of gaze and which practices of looking it encourages. The starting point of the exhibition is the First German Colonial Exhibition, which took place as part of the large Berlin Trade Exhibition of 1896 in the Treptower Park. From May 1 to October 15, 1896, the propaganda-like exhibition on the 900,000 m² site was visited by more than two million people. The so-called scientific-commercial section, which mainly aimed at demonstrating the superiority of the German Empire, was contrasted by an “ethnological section”, which with its ostentatious installations in the middle of the park was supposed to satisfy the curiosity of the white population about the allegedly primitive. For this part of the exhibition, 106 children, women and men had been recruited as performers – or „acquired”, to use the terminology of the exhibition catalogue of 1896 – under disputable circumstances for the length of the Trade Exhibition by the government of the German Reich. Now, about 120 years later, the Museum of Local History in Treptow/Berlin uses this local history as an opportunity to address – in cooperation with the Initiative Schwarzer Menschen in Deutschland (Initiative of Black People in Germany, ISD) and association Berlin Postkolonial – German colonial history by focussing on the stories of these 106 Black People and People of Color. This perspective is made visible from the very beginning of the exhibition. The opening text, for instance, refers to the story of Kwassi Bruce, the youngest participant of the First German Colonial Exhibition. Born in 1893 in the former German colony of Togo, he at the age of three years travels with his parents as part of a larger group to the Berlin Colonial Exhibition. He later grows up with white adoptive parents and works among other things as a professional musician with his own company, touring the German Empire and later Nazi Germany. Hence, the long and interwoven history of the presence of Black People and People of Colour in Germany lies at the heart of this local history exhibition from the beginning. Along the narrow corridor of the Museum, the debates of the time regarding the colonial aspirations of the German Empire are explained in detail: the commercial interest groups are mentioned as initiators of the trade exhibition, and their involvement in the colonial cause explained. The section on the collaboration of the Berlin Mission (I) in the exhibition of 1896 also discusses the phrase „Go and Preach all Pagan”, which remains still inscribed above the entrance of the Berlin Mission in Berlin’s Friedrichshain district, today. Such subtle references to the unbroken continuities in Berlin’s everyday life is what make „zurückGESCHAUT” a noteworthy contribution to the debates on how to go about remembering German colonialism. The opposite side of the room deals with the „ethnological section” of the 1896-exhibition and analyses the colonial-racist representations in the First German Colonial Exhibition. It is at this point the latest that the cautious title „zurückGESCHAUT” manifests itself: In this section, the curator team explicitly problematizes how colonial-racist images are handled specifically in exhibition texts, highlighting that the cooperation of Black people was central in the development of this exhibition. This exhibition does not refrain from displaying colonial-racist imagery entirely. 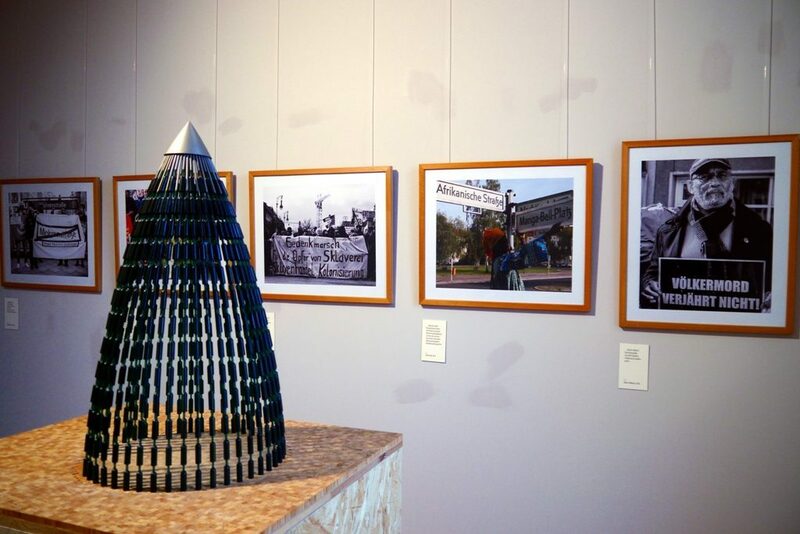 It does show a group photograph of the colonial exhibition with black performers and white colonizers arranged according to racist notions of society. However, the historical photograph is framed by explanations. The text describes the picture in detail. Directing the visitor’s view, it underlines how the people are arranged – the white men at the head of the group photo, in front of them black men, women and children assembled in pyramid-shape – and thus revealing the constructed character. It is through this responsible attitude towards the pictured subjects in the photographs on the one hand, and regarding the handling of historical representations on the other, that the following section, which also forms the heart of the exhibition, opens up space for a deeper engagement. 106 portraits, mounted on chipboard, some accompanied by black and white images some without, peer at visitors from the walls. In the middle of the room there is a wooden box with a massive catalogue titled Germany and its Colonies in 1896. Official Report on the First German Colonial Exhibition. Placed next to it, a pair of theatre binoculars. It is the attempt to represent the biographies of the participants of the former exhibition; the attempt to reconstruct their histories before and after 1896. Attached in front of the respective portraits are boxes containing first research results regarding their life stories. Martha Kamatoto, for instance, travelled back to Hereroland after her participation in the show, where during the looting whilst the genocide of 1904-1908 a group photograph showing her in Berlin in 1896 was found. This photograph was brought back to Germany and highlights – as the exhibition text indicates – the interwoven Namibian-German history, and the path that led from the colonial exhibition in Treptow to the colonial genocide. Another story is that of the Cameroonian Kwelle Ndumbe/Bismarck Bell, who as a participant of the colonial show acquired a pair of theatre binoculars in order to look back onto the visitors of the 1896-exhibilition within the setting of the Treptowers Park. These two stories indicate in their diversity the range of stories of these children, men and women from Africa and Oceania Some portraits are without photographs, only mentioning the names of the people and the context of their origin. 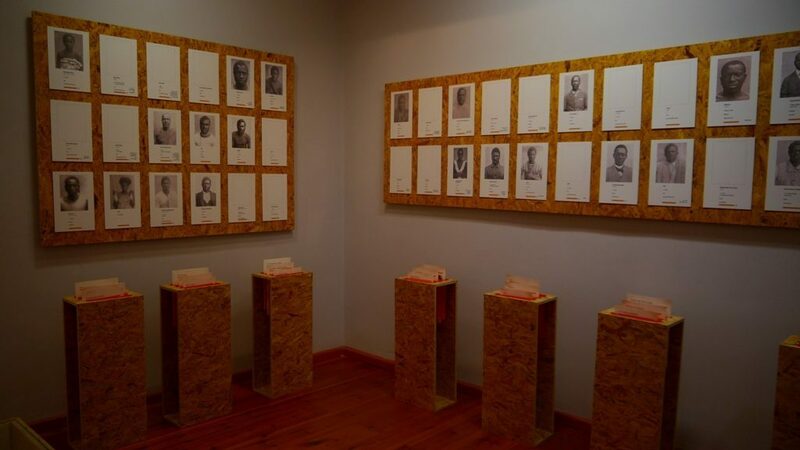 Displaying the portraits of all 106 participants – with their photographs and missing images – in this one room, surrounding the visitors from all four walls, problematizes once again the practice of gaze chosen for this exhibition. This responsible perspective, which Irit Rogoff demands for the work of museums, is encouraged here and further developed in the last room: the room depicting current positions of Black people and People of Colour in Germany. Again, photographs play a key role. They exemplarily illustrate examples of the current protests and social movements of Black people living in Germany and People of Colour: actions for the renaming of street names, the campaign Völkermord verjährt nicht (There is no statute of limitation for genocide), and the protest alliance No Humboldt 21. The question of recognition and remembrance of Black history in public space today is especially addressed by the model of a monument titled The Shrine of Forgotten Souls of Berlin-based Black British artist, Satch Hoyt. Shown in the centre of the exhibition room, this work of art, which only exists as a model, calls for a place of public remembrance for Black histories. Sensitive in language and imagery, „ZurückGESCHAUT” manages to focus on the stories of the participants of the exhibition of 1896 without falling into a style of demonstrative consternation. The exhibition is particularly convincing in the way it consciously deals with the gaps in the stories, deliberately giving them room. The absence of sources from the point of view of the colonized, which is often criticized in the context of exhibitions on colonial history, is itself partially exhibited here and at the same time visitors are invited to set out on a search for the untold stories. Although this exhibition was realized in a small museum of local history with most probably scarce financially means and therefore lacks a highly polished design, it successfully encourages the visitor to question one’s own practice of looking. Anujah Fernando is currently doing her PhD on transformation processes in ethnological museums in the German-speaking world within the framework of the joint initiative Worlds of Contradiction at the University of Bremen. Prior to that, she studied Sociology and Cultural Philosophy as well as Cultural Analysis in Leipzig and Oldenburg. Her MA-Thesis (publication in preparation) addresses representations of positions of Black People and People of Colour in the special exhibition German Colonial History. Fragments of its history and the present of the German Historical Museum (2016/17). After working for the exhibition The Blind Spot. Bremen and Art in the Colonial Period at the Kunsthalle Bremen, she is currently working at the House of World Cultures in Berlin. See Brändle, Rea (2007). Nayo Bruce: Geschichte einer afrikanischen Familie in Europa. Zürich: Chronos Verlag. See Rogoff, Irit (1993): ‚Der unverantwortliche Blick. Kritische Anmerkungen zur Kunstgeschichte‘, In: Kritische Berichte. Zeitschrift für Kunst – und Kulturwissenschaften. (21,4) pp. 41-49.